It is evening in the backyard and garden of a contemporary hillside home in Southern California. There is a swimming pool, a flagstone patio, a redwood fence, some lawn and the usual tropical landscaping of succulents, ferns, leafy plants, and flowering shrubs. The beauty of the scene is most evident at this time of day when the combination of lighted pool, soft garden lights, black sky and the lights of surrounding homes comes into play. On this particular evening a small cocktail party is being held on the patio adjoining the house. The guests are all close friends of the host and hostess. Their presence adds the elements of motion and sound to the setting; the men stand near the edge of the patio engaged in relaxed conversation, while the women sit in a loose circle of garden chairs arranged on the lawn. Now the hostess comes out through the sliding glass door to announce that a light buffet supper is ready inside. These words appear, typed on a single sheet of paper, on the wall adjacent to William Leavitt’s installation California Patio (1972). They economically set the scene for what is itself an economical piece of scenery: a freestanding section of wooden wall framing a sliding glass door, bracketed by curtains. Through the open door we see paving slabs and a few shrubs, partly illuminated by two outdoor lights. What we don’t see is the guests at the cocktail party, nor do we hear their chatter. The structure is not a place but a picture, as brittle and as unconvincing as life itself can sometimes be. At the current retrospective of Leavitt’s work, at the Los Angeles Museum of Contemporary Art, you can walk behind the row of plants (they turn out, on closer inspection, to be artificial) and look back through the doors like a nocturnal trespasser in a suburban garden. As it happens, this is more or less the position that Leavitt himself has taken – metaphorically, of course – in what is almost half a century of installations, paintings, drawings, photographs, plays and sound works. He moved to California from Colorado in 1965, and found the city of Los Angeles ‘quite a peculiar place’.1 Since that time, his art has been concerned with the region’s distinctive architectural vernacular, and the patterns of living that it impresses on its inhabitants. Leavitt has acquired a taste for strangeness in the midst of familiarity, which he tempers with the acknowledgement that it may be within himself – or at least, within his work’s protagonists – that strangeness lies. Exploring a work like California Patio, we soon find ourselves in his shoes, lurking in the flowerbed. Seen from behind, the wall reveals itself to be made from plywood and one-by-four-inch timber. Like the flimsy curtains and the processed bark chippings underfoot, the scene is ‘only as real as it needs to be’, in the words of curator Bennett Simpson.2 An oft-repeated but delicious anecdote has Leavitt in 1965, new to LA and in the wake of the Watts Riots, undergoing riot training for the National Guard on a film studio lot where leftover sets provided a suitable backdrop for manoeuvres. The thinness of the deception was thrilling to the young artist. He settled in the landlocked and unlovely area of the city known as Mid-Wilshire. Its low rents (and faded grandeur) attracted artists, and Allen Ruppersberg and Bas Jan Ader were friends and neighbours. LA’s provincialism in this era, according to Leavitt, suffers from exaggeration; affordable air travel, an emergent art press and a thriving educational community combined to attract currents of the global avant-garde. He and his colleagues absorbed the influences of Fluxus and European Conceptualism, then passed them through the filters of daily Los Angeles life – an existence that tends toward detached domesticity and intimate social interactions. Leavitt’s Study for “The Lure of Silk” (1973) is a vertical column of black and white photographs, objectively documenting details of a plush, middle-class living room. Only the unnatural cleanliness of the surfaces and the lack of clutter hint that this is, in fact, a furniture showroom. The photographs became a ‘study’ for a film treatment that Leavitt wrote a year later – it was never produced, nor did he expect it to be. It is nevertheless significant that even at this early stage he was creating situations in which objects or images deferred to other situations, other contexts ­– action that is yet to come or which has already happened. Leavitt’s take on bourgeois taste is not without humour. The deadpan title of Painted Image (1972) belies the work’s silliness: on an easel, a gauchely framed portrait of a German Shepherd dog beseeches us to take him home. The painting, proclaiming its objecthood, becomes a MacGuffin in a host of possible dramas and exchanges. The picture itself is hardly the point. A later installation, Manta Ray (1981), places a painting of the eponymous fish, swimming through inky blackness, on a wood-panelled wall that seems to belong to a car showroom, office or restaurant lobby. A pot plant sits on the floor and a section of textured ceiling, with recessed lighting fixtures, juts out overhead. Here again, the painting is, to paraphrase Simpson, only as good as it needs to be; Leavitt’s economical style is accomplished enough to allow us to plummet through the installation’s referential portals, though not deceptive enough to take us anywhere other than where we stand, flummoxed, in the gallery. John Baldessari recently wrote, approvingly, that Leavitt captures ‘nearly everything I hate about Los Angeles’.3 Leavitt himself is never so emphatic. His apparent ambivalence towards his subjects derives from a desire for objectivity; the disturbing sterility of his aesthetic may, however, conceal its own critique. Peter Schjeldahl described the painting style of Edward Hopper ­– an artist to whom Baldessari also compares Leavitt – as ‘graceless’, ‘acrid’ and ‘numb’; the epithets could equally be applied to Leavitt’s pastel drawings.4 Interior with Pink Chair (1982) shows a room, tiled and ceiling-panelled, containing a single seat against one wall. As with an architect’s rendering, the drawing ends in a broken, sketchy border, indicating continuation but also putting the scene in aesthetic quotation marks. Leavitt is fascinated by edges, and by the dubious threshold between civility and wilderness. In the drawing Sliding Door(1980), cacti reach their spiky branches indoors as if probing the soft furnishings. The desert landscape outside resembles the surface of the moon. It was around this time that Leavitt began deliberately to paraphrase the visual language of science and space travel – and later, a still richer seam of science fiction imagery. The New Tesla Laboratory (1982) shows lightning crackling around an unseen apparatus in the darkness through a window; its combination of banality with the scientific sublime is appropriate for a city in which rockets launched from nearby Vandenberg Air Force Base can occasionally be glimpsed in the evening sky. The bathetic anachronism of popular visions of the future really emerged, however, when Leavitt started noticing uncannily cosmic forms in household appliances and fixtures, as in Big Barbecue (1985) or Seven Ceiling Lights (1986). His observations were twofold. He realized that the ellipse ­– a form that recurs, usually wonkily, throughout his drawings and paintings – had become a devalued aesthetic indicator of modernity, now used to sell barbecues, patio lamps or popcorn makers. 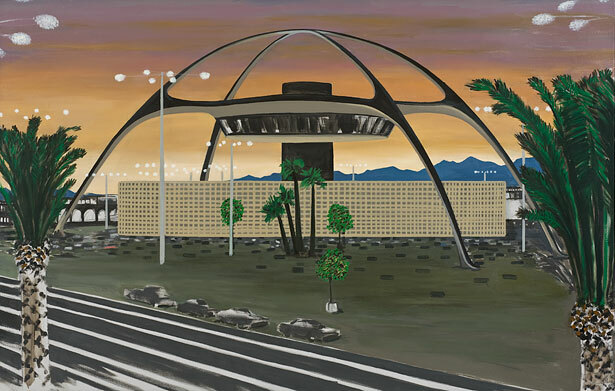 It had derived from pictures of flying saucers, and from Googie architecture’s emulation of planetary and atomic orbits (as seen in Theme Restaurant, Leavitt’s 1986 painting of lax airport’s iconic structure, built in 1961). Furthermore, Leavitt saw that this adherence to the image of a future that never arrived had left Californians – and most of the Western world – with alien-looking objects beached in the middle of their homes. A more recent series of paintings and, notably, the installationWarp Engines (2009) sees not ellipses but molecular models barge their way into suburban interiors. Leavitt calls such scientific icons ‘totems’ or ‘talismans’. Despite their arbitrary shapes (an atom or a molecule doesn’t really look like that) they persist in embodying a certain faith in scientific reason and insight, which Leavitt recasts as mystical, hallucinogenic apparitions. The installation Planetarium Projector (1987) convenes around a painting of a nocturnal desert landscape featuring, at its centre, a carbuncled black form supported by metal legs. The title helpfully betrays this sinister object’s function; except it’s not in a planetarium, and it appears to be projecting stars onto the sky above. 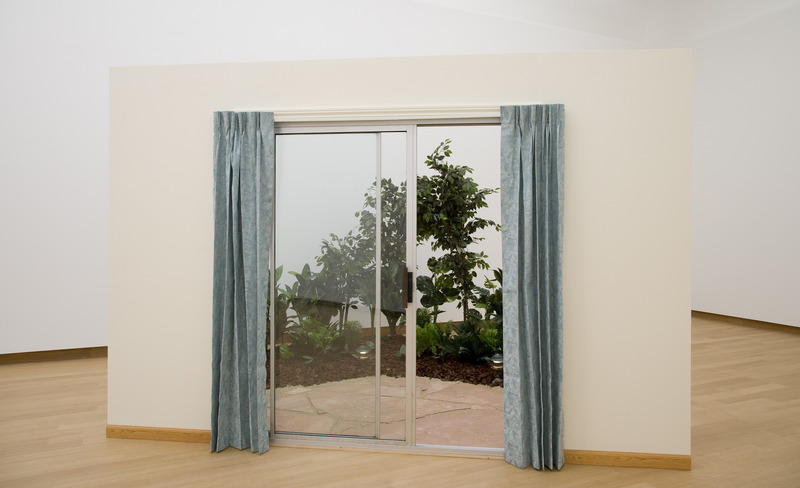 This rather bleak proposition cues up the rest of the installation: a shallow dividing partition, a curtain, a pot plant and a weak spotlight placed on the floor. Beneath the painting, laughably, is a small drift of sand, as if the canvas could not contain its surfeit of realism and some had dropped out into the gallery. The question of where fantasy ends and so-called reality begins is a facile one in a city like Los Angeles. Leavitt’s attention to edges notwithstanding, perhaps the more productive enquiry here is into what supports the structures of these illusions. In his essay ‘Upon Leaving the Movie Theater’ (1975), Roland Barthes ponders the problem of how to become ‘unglued from the mirror’ when going to the cinema.5 His solution is to allow himself to be ‘fascinated twice over, by the image and by its surroundings’; in so doing, he ‘complicate[s] a “relation” by a “situation”.’ Ultimately, Barthes argues, it is the possibility of distance between himself and the image that he finds fascinating. Though the suggestion of distance is always dangled in Leavitt’s constructed situations, I’m not sure it is ever really possible, at least in the way that Barthes imagined. Despite the ‘phenomenological bracketing’ (Leavitt’s phrase) that he effects on a painting of a manta ray or a dog, for instance, the viewer cannot ever quite unglue him or herself from the mirror.6 Leavitt’s subjects are too close to home, in every sense. Despite being drawn to the ritualized, distanced way in which cinema and television handle behaviour and emotion (from the films of Alain Robbe-Grillet to Hammer Horror and daytime soap operas, all of which Leavitt acknowledges as influences), the dramatic form towards which his work gravitates is theatre. Sometimes it even arrives:Spectral Analysis (1977) is a stilted dialogue between a man and a woman watching television, late at night, to be performed within an installation of the same name. No stage removes the action from the audience. Melodrama is the dramatic form in which the narrative elements – character, costume, set, dialogue – have been abbreviated to the barest, most unambiguous and untroubling simplicity, in order not to obstruct the forward movement of the narrative towards its satisfying (and inevitable) resolution. Leavitt’s work is always involved with movement or flow – it is about things leading to other things, about curtains that only exist to be looked behind and doors that only ask to be passed through. It is, he says, ‘always arriving’.7 The difference, however, between Leavitt’s work and melodrama is that he never delivers us to the expected conclusion. Instead, he leaves us at the back of a set, looking at fake plants, sandbags and bare struts of timber.